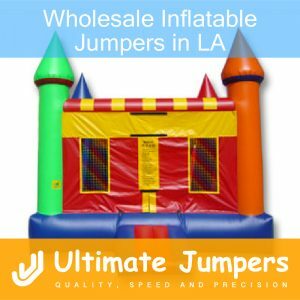 There are tons of wholesale inflatable jumpers in LA, but not all of them can provide quality jumpers to their customers. Before you make any kind of investment regarding wholesale inflatable jumpers in LA, it is vital to do some research. Where are the inflatables manufactured? It may not seem like an obvious question at first, but the location of the inflatable manufacturer is crucial. Some manufacturers sell wholesale inflatable jumpers that are not made in the USA. Price should not be the priority when it comes to purchasing units that are durable, safe, and long-lasting. It is wise to purchase directly from the manufacturer, so that you know exactly where and how the inflatable jumpers are made. For example, Ultimate Jumpers, Inc. manufactures all of their wholesale inflatable jumpers in LA. How is the quality of the inflatables? Quality is of the utmost importance when it comes to wholesale inflatable jumpers in LA. Make sure you are getting inflatables built with the best quality materials, because they will last you the longest. Ask about the vinyl type, the stitches, the air flow zippers, etc. At Ultimate Jumpers, Inc., every single jumper is inspected closely before being delivered or picked up. Does the inflatable jumper have a warranty? A warranty guarantees that the manufacturer is confident in the products they create. If you purchase products from China or other countries, how will you ship them back for repairs and/or replacements? All of the inflatable jumpers manufactured by Ultimate Jumpers, Inc. come backed with an incredible 3 year warranty. It is important to do your research prior to making any investments in your business. You will ensure that the children who will ultimately enjoy the inflatable jumpers are in the safest environment possible.